We had a very early snowstorm here yesterday afternoon. The crews were out putting salt and brine on the roads so needless to say my ex-California car 2002 did not see any use. All the snow has melted from the roads, leaving them dry. However, I worry there's probably a lot of fine salt dust/residue and so forth that would still get kicked up on the body and undercarriage of the 02. How long would you wait before exposing your 2002 to the streets again? I usually like to wait for a nice rain to wash the last of the salt away but it looks like it will be clear all week. yup, gotta wait for a heavy rain to wash all the dried solution and salt dust off the roads. It really only gets transferred to the car as a moist spray. You are fine to drive on dry roads. um, no. the brine/salt dust gets everywhere under the car. then the rust starts when it gets wet. if the road looks white or there is salt on the road edges, keep the 02's in the garage. How long would you wait before exposing your 2002 to the streets again? I live in snow country and agree with you, keep the 02' s in the garage. But my daily driver (a VW Golf, not an irreplaceable 48 year old BMW treasure) has to endure the salt so I wash it frequently. Dry bare winter roads are not as bad as the moist slushy salt spray after a fresh snowfall treated with salt. That gets transferred into every book and crannie much worse than salt dust. That’s probably the safest option but I only just got the car in late September I’d hate to put it away so soon. End of April in the North East. Wait a minute! Not quite yet. I'm watching and no trucks have been out yet. At least not where I live. We're just above freezing with a few sunny days coming up. One last hurrah. I've noticed that commercial parking lots are the first to get massive chunks of salt put down, and the municipalities follow soon after with the brine solution on the roads. Whenever I get caught off-guard and drive anywhere near salt, I rinse under the car and let it dry before putting it away. I'm especially concerned with the fender channels behind the front wheels and under the rear quarter panels beside the gas tank and the spare tire well. Wet leaves and dirt find their way into the those areas and stay wet for way too long. Side note: Before you put your car away for the winter, clean under the radiator, inside the nose clip. 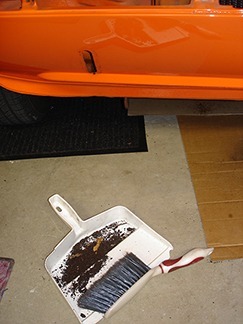 If you drive AT ALL, dirt could collect there from other drivers' rear wheels kicking up debris into your grill. If the dirt etc. doesn't drain out it sits there forever. When you wash your car it adds more moisture to keep the dirt wet. We've seen the result of this in the rusted-out nose clips. Right? I've had some small rocks, a couple of bolts and washers blocking the drain holes. I had some small rocks, a couple of bolts and washers blocking the drain holes. So I'm pretty new to 2002 ownership I said. Can you please tell me how to access this area for cleaning? Do I need to dismount the grille slats or can I go in through the engine bay or something? I'm especially concerned with the fender channels behind the front wheels and the under the rear quarter panels beside the gas tank and the spare tire well. Wet leaves and dirt find their way into the those areas and stay wet for way too long. ...when you find out that you are behind salt truck on a mission.